The Great Debate II: pencils with or without an eraser? Following our first poll on pre-sharpened pencils, we consider the question of pencils being sold with attached erasers. The manufacturer lineup is a bit different than on the sharpened/unsharpened question. American manufacturers tend to be the ones generally offering pencils with erasers. But exceptions abound – the photo shows the famous Faber-Castell 9000 in both traditional and eraser attached versions. Japanese manufacturers do make at least novelty pencils with erasers. There are some potential problems with attached erasers. The eraser isn’t always the type one would like. The photo shows a white vinyl eraser, but most pencils come with a Pink Pearl style eraser. What if you don’t like the style or type of eraser that comes with your pencil? You are stuck. The eraser on a pencil tip is also fairly small, and can easily be used up if one does a lot of erasing. The remaining bit of ferrule and eraser stub doesn’t look so appealing, nor is it useful. The eraser can also harden over time. 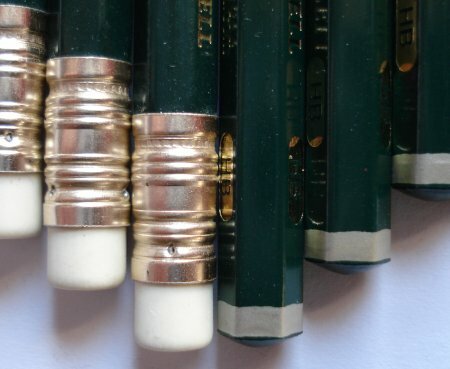 The erasers on many older pencils are dried up, even though the pencil is still otherwise in great condition. Some ferrules can also rust over time. As well, consider the manufacturer’s dilemma – a first rate pencil (the core of the business) could be diminished in the marketplace by a second rate eraser. On the plus side, the attached eraser can be an immense convenience. One single object to hold and use is the ideal. It is also what some may consider to be an intrinsic part of the pencil experience. It just “feels right” for many. This mode of usage continues in modern touch screen devices. I attended a lecture where the speaker had a touch sensitive tablet, and wrote on it with a stylus. The tablet screen was projected onto a large cinema-style screen so that the audience could observe. To edit a diagram, the speaker turned the stylus upside down and “erased” previous markings. The well known interface of pencil erasing was carried on in a paper-less, pencil-less format. So what do you prefer, and more importantly, why? Feel free to leave a comment as well as vote in this poll. I found your website by accident, and I am glad I did. I participated in your poll. I prefer pencils with erasers, although some otherwise good pencils could do without them, e.g. Papermate American Naturals. The lead is decent enough, but the pink erasers are the worst. I used to visit a website called Pencil Revolution, but it has been dormant for over a year now. Being a pencil person, I am really glad I found your website. Good work! No eraser for me; they ruin the balance of the pencil. iarmas – Welcome, and thanks for dropping by. scruss – Good point about the balance. I don’t know about balance…I think the balance of an eraser pencil is just fine (and the erasers tend to add just a bit of “weight” that makes the pencil more substantial). But to me, it’s all about options. With an eraser pencil, I still have the option of foregoing the included eraser in favor of a better one — if one is around. If there is no eraser, I *have* to bring one with me, which can be difficult. Given that my primary mode of carrying pencils is behind the ear, having the whole thing in one package (pencil + eraser) is a bonus. No eraser for me. I like using up all my pencils using a pencil extender and the ferrule and eraser bit just gets in the way and need to get pulled out with a pair of pliers before it can go on the extender. Plus, I get somewhat attached to the erasers I use and I carry the current one, a three year old staedtler mars plastic, along with me nearly everywhere. No eraser for me. Sometimes an eraser is good, but overall I prefer to bring my own decent eraser. Some eraser tips on pencils are USELESS and I don’t like paying for junk. Sometimes its good pencil, useless eraser so it spoils the package. When I was a little boy, Korean pencil manufactures seldom made eraser-attached pencil. Only some kids who had relatives living in foreign countries (especially U.S.) could get that kind of pencils. I was one of the kids who don’t have any relative who can present erasered pencil, I remember that I had never used it. Now the GDP of Korea has grown almost tenfold, 20 years have been passed, and some of American #2 pencils, those are absolutely eraser-attached model, are the cheappest sorts available in Korea. But still now, I feel some kind of compensation to my childhood when I get an erasered pencil. I also prefer the look of a pencil without an eraser, especially one that has the ends sealed an lacquered like the Tombo Mono (my current favorite), and my Lumograph’s. Thanks to all for some great comments. I’ll leave the poll open for another 24 hours. Well, some gremlins knocked the site offline for much of today, so we’ll extend the poll for another day. Palominos with eraser look pretty sharp and the added weight, much like a fountain pen with the cap posted, improves the balance of an otherwise feather light instrument. And a balanced pencil makes for an accurate projectile, should the need arise. Don’t make me go Jason Bourne up in here. I’ll comment without voting, as I really have no preference (and it seems to be too late to vote anyway). I like the varieties of beauty and design in distinctive ferrules (esp. the classic Mongol, before it was updated). But I also like pencils without erasers, which in their austerity somehow make me think of unfiltered cigarettes. I enjoy the erasers on the Dixon Ticonderoga, a good behind-the-ear pencil, but I cherish most my stash of Palomino and Lyra Orlow-Techno eraserless pencils. Excellent poll with telling results! I prefer to have an eraser attached. Problem is I like a hard lead (3H-5H), and I don’t often see those pencils with an eraser in the shops. It seems to me if you don’t like it you don’t have to use it – but I guess it provides too much temptation (being so close), or effects the balance for some people. It sure would be neat if one could buy slip on ferrules. i suppose I could try to use those eraser caps instead, but they really are heavy. Nice site! Found it while googling for the Staedtler Oversized 151 that I just bought. I personally prefer no erasers. It could be because the pencils I’ve used in the past have erasers of crap quality, and I’m particular about how well my erasers… erase. And I erase a lot (LOL) so the little bit would run out in no time. But even if the attached eraser is of a decent quality, I don’t think I’ll use it much because I’m more of a block eraser type. I like having the eraser on the pencil. If I need to erase something, I just flip the pencil over, erase, flip it back and continue writing. I don’t have to put the pencil down, pick up the eraser, erase, put the eraser down, pick up the pencil and continue writing. Plus I love the aesthetics of the ferrule and eraser. It adds another potentially distinctive element to a pencil’s design, which I miss with eraserless pencils. I like having both, and the way it is in the USA with the pricey ones having lacquered ends and the rest eraser’d appeals to me. When I bought Palominos, I got some of each. I love the Pentel Clic-Erase, preferably the older one w/o grip, and if I were drawing, I’d use that instead of an on-pencil eraser if I had one. For general writing, I just don’t erase much. Even erasing the same number of words, I think I use less than most people being lighter and more selective. I frequently did math with a pen in college, and also, am not opposed to scratching out a word here and there. That said, in college I was very happy that the Sanford Logo IV had a nice large very high quality eraser. But, unlike my friends, I think I used two of the (inch long) erasers in as many years. So, assuming the eraser works halfway decently (dried ones on vintage pencils, ugh) then I like having it. Feels “right” for a writing pencil. I like the ferrule, I like bouncing it on the desk, all sorts of tactile things about it. Now, should I use up the eraser and the pencil be both long enough & expensive enough, I _might_ just use a hobby saw and cut the ferrule off. A lacquered end is classy, but I see plenty of euro-pencils sold with sawn or sanded ends. I have always really disliked the erasers on Pencils. They last a short time and then you are left with a sharp, ugly ferrule. I like soft, dust-free erasers and almost always have one on me. When I moved to Korea I noticed that the ends of pencils (made by Korean’s Dong-a, Japan’s Tombow, or Germany’s Staedtler) were eraser free – not just the drawing pencils but the writing pencils as well. Some had a nice, smooth, rounded back, but others just had the exposed graphite. After returning to the US I bought a few boxes of pencils – I like the terracycle recycled newspaper pencils and Office Max’s natural wood pencils. When I need a new one I pull it out of the box and pull the ferrule off with a pair of pliers I keep by my desk. Then I sharpen the end I pulled the farrule off of. This leaves the pencil with a smooth back end. It looks as if the pencil was made to be eraser free. The manufacturer’s text also sharpens off first. Sometimes I cover the exposed graphite with a little black nail polish. In a classroom, I require students to use a pencil without an eraser. Otherwise, they are constantly writing and erasing and writing again, rather than thinking first before writing, and the tiny eraser in the ferrule would be gone before even a centimeter of graphite is consumed. Later, when exercises have been graded and students are allowed to do corrections, good quality large erasers are provided. This is just one example of why one would want to separate the pencil and the eraser. Personally, I have almost always used a better quality drafting or drawing pencil, or a lead holder, which are typically made without an attached eraser. I like having the Eraser on the Pencil for Convenience and not having to worry about carrying and keeping up with a separate Eraser. I just don’t like the Idea of putting down Your Pencil to pick up a Seperate Eraser every time You make a mistake! Finally, there’s the issue of Eraser running out, that’s what Eraser toppers are for! There’s also the issue of the quality of the Eraser. If the Pencil itself is Premium and of high quality, then the Eraser on it should be of the same quality! Furthermore, some say that the Eraser in the Ferrule dry up over time. Does a big Seperate Eraser dry up over time the same way? Over some thought, Yes, Pencils wasn’t Coupled with an eraser from the beginning; Erasers where discovered later. It wasn’t until an invention later on that would cause the Pencil to be fitted with an Eraser. Now, would Purist prefer to still leave the Eraser off the Pencil, or are some People either afraid or too stubborn to adapt to Convenience?